How do you make a dent in such a huge crisis? The orphan crisis worldwide is overwhelming. But our God is described as "Father of the fatherless." (Psalm 68:5). How do you reach 147 million orphans? One at a time. And that's what we hope to do. Reach one little girl who needs the love of a family and ultimately needs to know the love of God. "God settles the solitary in a home..." (Psalm 68:6). While you may not feel called to adopt, you can still be a vital part in mirroring the Father's heart. You can help us bring change to one little sweet girl. And the simple way you can help us is with.... your spare change! We don't need you to dig deep and sacrifice (unless you feel called to!)... but how about all that spare change that ends up in the couch cushions, in the car, or in the dryer? What about the change that clutters your pockets or your purse? If you would like to donate your change to help us in this journey, we would gladly use it toward our next adoption expense, which is our $1500 home study. A dozen or so of these pink cups have already scattered throughout the state with family and friends. We know God will provide, but maybe He will use you! If you are interested in donating your spare change to change the life of this little one, then please use the contact form below to let us know. We will gladly send you several pink sippy cups. Keep one and give a few to family or friends. See what God will do in the life of this little one because of you! 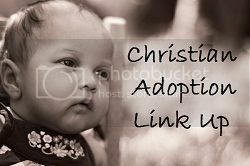 We would love to have many of you be a special part of God's story and glory in this adoption.